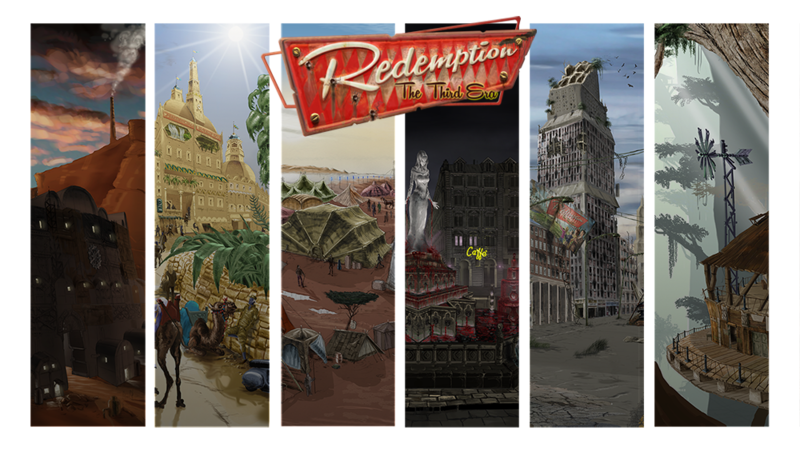 Below you can see other three examples of ‘critters’ populating the ‘Redemption – The Third Era’ world. 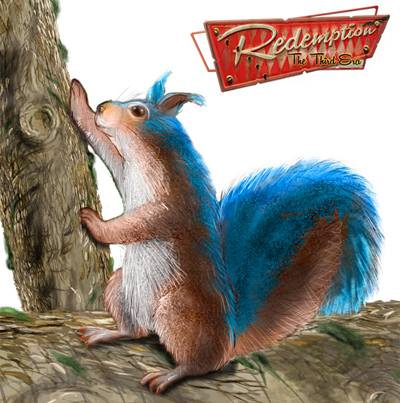 The Blue Squirrels have always been the natural inhabitants of the immense forests of Khun where the Tamiara people lives. People that loves nature had made a symbol and guide of these soft rodents, free and independent. The wingsuits of the tree people have been inspired by these small creatures and simulate the conjunction membrane that connects the front and hind legs so useful for flying. The appearance of the Blue Squirrel is very similar to the common flying squirrels, but they are slightly bigger. The nickname ‘blue’ derives from the dorsal streaking of the hair that assumes blue tones, passing from a lighter to a darker color as the animal grows older. The caves and underground tunnels of the Damas cities are inhabited by a great number of these nice creatures. There are two different species of them, but the most common ones are those with six legs or two tails. 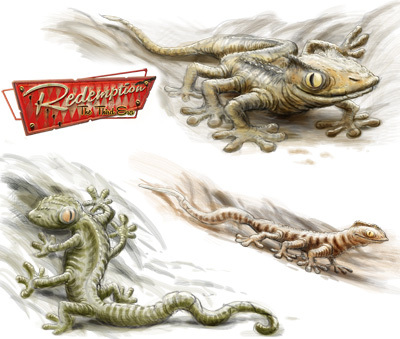 The coloring of their skin reminds that of the stone of which the tunnels are made and allows these small reptiles to camouflage in case there had been some enemies nearby. For the Damas they are really considered true ‘friends’ to cuddle and take care of. They are carnivores and it is not unusual that in a burst of anger they could even bite their own master, that is why every Damas respects them and treats them with extreme care. The Vampires cities are all deployed along the semi darkness strip that announces the approach of the Frozen Lands. The Frozen Woods is a long strip of land covered by frozen trees that is infested by large white wolves, amongst other beasts, the Frozen Wolves. They got their name from their white hair that is often covered in frost and that gives them a spectral and ‘frozen’ appearance. Their eyes are reddish and they are able to catch any minimal sparkling of light, lighting up with illuminating effects. 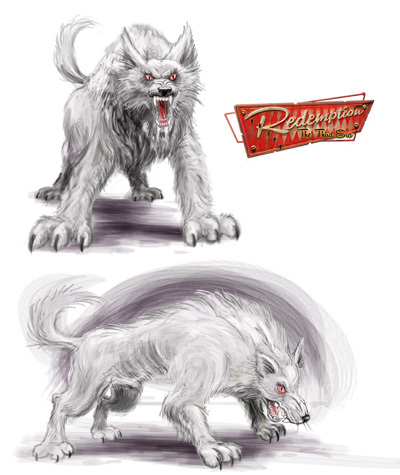 They cannot be considered ‘pet animals’, but the close proximity to the Vampires ensures these creatures to often circulate in the cities looking for food or other things and, if approached with the right prudence, they can also show to be docile and to be tamed. The cases of Vampires that have as travelling companion a Frozen Wolf are rare, while tales of people that have died from the aggression of such specimens are on the agenda.